Earlier this week, we took a day out of the office and headed to our first competition of 2019. As you'll have seen, we've spent A LOT of our arena time over Christmas and in January trying to work on our showjumping, including riding a totally different way. I've felt, even at home and on hack, that Louie isn't enjoying the new way, but does respond positively to it when the jumps are in front of him. As such, I've felt him become a little resistant to the contact, slightly less supple and willingness to bend, and overall just waiting for me to really get a hold of him. Even at home in the arena, this has led to him feeling much more tense and less willing to reach forward and through his frame. A lovely luxury time of 11.17am for our first test. Great news! I could plait on the morning and leave the yard after any possibility of rush hour traffic. I even got an hour's lie in compared to a working day... It's all about the small wins! I'd entered two Novice test, as although we haven't been out competing for two and a half months, I felt we'd done enough at this level to go straight back to it. It was one of the coldest mornings that we've had since the New Year with a cold blasting wind, so I was once again mega grateful for my Equetech coat from Boudica Equestrian to keep me totally cosy while plaiting, stain removing and brushing Louie. I was out of practice for plaiting, so it took me a little longer than usual. I was out of practice from removing tough poop stains, so parts of Louie's dark dapples looked almost purple! I wasn't out of practice to leave on time, but I was out of practice for timing how long I needed at the venue... Although we arrived in good time, I mucked up when I needed to get changed and when to tack up. So we arrived at the warm up with a little over 20 minutes until our test time. The venue does have an indoor warm-up but it's square and small when it's all pegged out for the test arena. Well, that's not fair, it's not small, but if you have a tendency to sit back and allow your horse to just look pretty, it doesn't encourage you to ride forward. As such, at this venue, I always spend 10 minutes or so outside. I stuck to this, and had seven minutes inside... just enough time to really use the tighter corners to moderate out rhythm and push on out of, as well as suppling up our canter on each rein. I don't know if the wind outside did something to me, but his canter felt hard, against me, and short... Inside, none of that feeling! Good. However, and call me silly, but the judge called me into the arena two minute early. No, I know, that's not long really, but when you've planned several things to achieve in under severn minutes, it makes a difference. I hadn't cantered on our weaker rein inside and suppled it up. Where I went wrong... I got irrationally frustrated by this. Any horse would have picked up on this. And it led to the smallest mistakes becoming blown out of proportion. Half way through my test, I remember thinking STOP IT! Otherwise you'll muck up all of it, forget this movement, work the next. I really expected to gain less than 60%, as although every judge is different, I felt it was FAR worse than our last test at Holmside when we didn't break the 60% barrier. So I found it quite acceptable that we scored 61.43%... It was also the highest placed Bronze combination, but we were a whopping 12% from the leader, a Gold combination... Of which, the rider is a professional 3* eventer and the horse has 86 BD points and has been at Novice for over a year and has done a few season at low level eventing. When I got my sheet back, I was actually fairly pleased - the comments could have been SO much more negative and critical, but the final comments summed it up. Inconsistent and lack of suppleness through the back... I felt like I was reading a test sheet from a year ago. I fell out with myself somewhat in between tests, and was convince there was no point in doing the second one. But my stubborn streak was determined to show that come hell or high water, we were doing that blinking test! I only ever allow about 15 minutes for our second test when we've only had a 20-30 minute break, so I just headed inside. It was the same judge and lord help her this time if she asked me to go in one second early... Ironically, I was ready early, so I headed in two minutes early. I mean...what a douche I really am!!! We made a couple of mistakes, and had a few lack of bend moments, but at least this time it wasn't the wrong way completely! I felt is was so much better than the first test so was a little disappointed to see that the score only moved up to 64.61%... The same combination that won the first class was in this one too, and they achieved less than 2% more than us this time. So while our score doesn't seem high or much higher than the first test, we took a hug step towards the winner and the rest of the class was all bunched within a few percent. Once again, we were the highest placed in our section, and although we came home with two lovely red frillies, it is not the story of how our day went. Instead, we really showed that we haven't been working properly on our flatwork or that we'd been inside the dressage boards for a few months. I have taken a lot away from it, especially around how I need to learn to deal with frustration and not absorb so much pressure from myself to always "be perfect". If I had the day again, there's many ways I've have dealt with things differently and now, next time it happens, I genuinely can give myself a good talking to!! 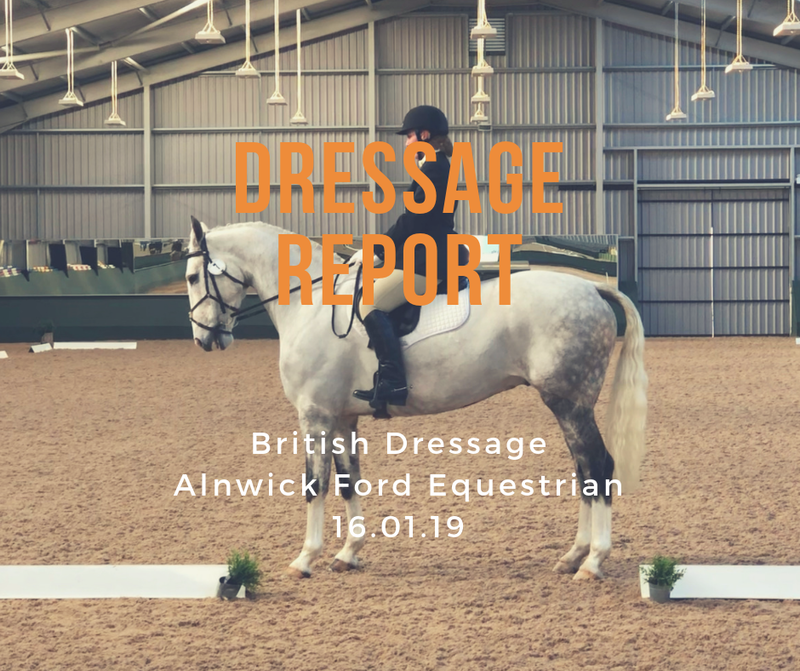 We're planning on another competition in another week or so, where we're hoping to put in much more practice and get back on track to our dressage goals for 2019. Keep your eyes pealed for our competition reports throughout the year if you want to see how we're getting on! You both look so much more chilled in the second test and you can see how super Louie’s paces are (especially that lengthened canter!). It’s certainly not an easy task to get back out there after your first test goes not to plan so well done! Very well done! I hate it when judges ask you to go in early, it just messes with me! Onwards and upwards. Well done! Very honest and a great start to the year!